Qualls-El was born in Detroit in 1979 and moved from neighborhood to neighborhood with his family before ending up on the city’s east side. He grew up watching morning syndications of Merrie Melodies cartoons and learned how to draw them; Bugs Bunny, Foghorn Leghorn, Marvin the Martian, and Yosemite Sam were all part of his self-blossomed art education. Drawing cars, often flying ones, was a recurrent pastime; their unfettered mobility represented “ultimate freedom” for him. A few years later, Qualls-El would be sentenced to mandatory life without parole for being involved—as a driver, not the shooter—in a homicide that would change the entire course of his life. 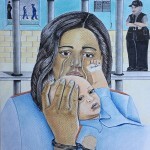 Qualls-El is an influential participant in the Writer’s Block, a weekly poetry and visual art workshop in the Macomb Regional Correctional Facility, a prison about 36 miles outside of Detroit. 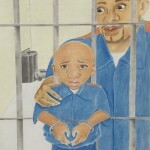 In the 22 years Qualls-El has been incarcerated, he has produced an enormous cache of drawings, paintings, comics, collages, poems, essays, and op-eds. In 2017, a major collection of his poetry, Thoughts Are Things, was published by Free School Press. “[Art] gives me a release from pain, frustration, anger, anxiety. It allows me a chance to say through my art what I might not say with my words,” Qualls-El writes in a recent correspondence from the prison. 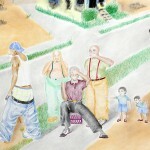 Qualls-El’s drawings are almost always figurative. 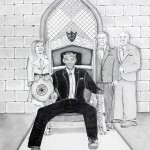 They often portray allegorical portraits of political or religious personages, as in In The Land Of The Blind The One-Eyed Man Is King (2014), which depicts a trio of blind Republicans standing behind a throned, one-eyed Barack Obama. 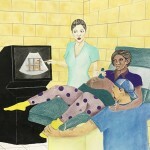 He often returns to and illustrates the problem of children behind bars in many works, including No More Tears (2013), Mother and Child (2015), and Child Behind Bars (2018). 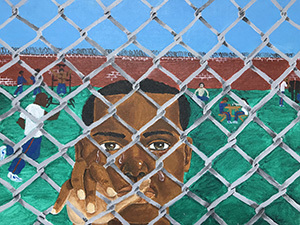 In each work, the subject’s tearful gaze is directed toward the viewer and underscores the multitudinous tensions and antipathy inside prison, issues of race, identity, and dignity. 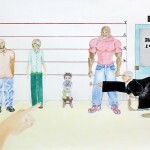 In Guilty (Line Up) (2014), an infant in a diaper with a pacifier and blanket is identified and accused as the perpetrator of a crime among a group of grown men during a police lineup (Qualls-El has drawn himself in, as an adult, to the far left and staring straight at the viewer). A sinister, hunched over judge with gavel and noose confirms the infant’s guilt in an allusion to Qualls-El’s own incarceration as a child. These works are made under incredible duress. 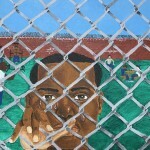 “Creativity is stymied in prison…you can not write what you want or draw what you want,” Qualls-El writes. He often makes work quietly, carefully, in a manner that doesn’t draw attention to what would be seen as institutional criticism out of fear of retaliation from corrections officers. Possible relocation and the loss of daily privileges are real risks of working politically as an artist and writer within prison. His color palette, often soft and muted pastel shades, is the result of several ever-impending facts: scarcity of materials, limited space to store his belongings, the cost of ordering supplies, and sharing a small cell with another man, among others. In spite of this, Qualls-El makes work. “It allows me to let time tick away in peace,” he says.